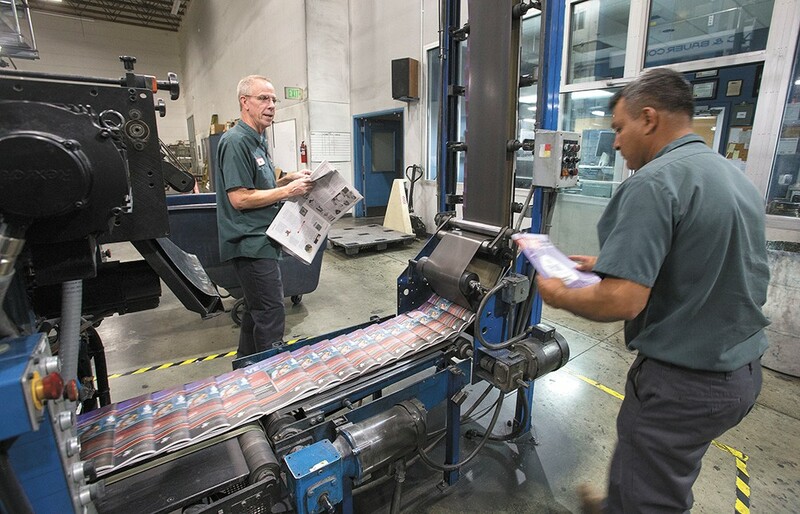 A rolling hum swells against the walls of the Griffin Publishing printing plant in Spokane Valley as machinery feeds the final ad inserts into the Sept. 13 edition of the Inlander. Press workers pull stacks off a conveyor belt and pile them onto pallets in 4-foot cubes. Nearly 50,000 copies sit waiting at the loading bay doors as delivery drivers start to arrive. Inlander distribution manager Justin Hynes stands alongside a fresh pallet of papers, chatting with plant owner George Griffin. Hynes wears a black hat with a black shirt and black shorts — attire that won't show ink stains. "Heard the Missoula Independent shut down?" Griffin asks. "No notice," Griffin says. "They said just don't come in." Corporate owners Lee Enterprises had closed the 27-year-old alternative weekly the previous morning. Disappointed, but only half surprised, Hynes has little time to mourn before the drivers begin loading bundles. At 64 pages, that week's Inlander covers Spokane City Council efforts to address homelessness, restaurant openings, a profile of a muralist, hundreds of calendar listings and the launch of a yearlong serial novel by local author Sam Ligon. Reporters have conducted dozens of interviews and fact-checked stories. Photographers have filed their images. A renowned illustrator has rendered the cover. Sales representatives have pitched, sold and proofed ads. Production designers have laid out pages — slotting in the cannabis section, concert coverage, movie picks, guest columns and crosswords. Meanwhile, somebody arranges vendors for the paper's community events like Volume and Restaurant Week. Somebody tallies payroll and files insurance renewals. Somebody posts headlines to social media and fends off the trolls. Somebody brews that third pot of coffee. Somebody keeps the Wi-Fi running. Somebody, somewhere compiles the I Saw Yous. And as other newspapers across the country struggle and shutter, everybody is still planning for growth. Hynes takes over near the end of this weekly miracle. As the copies come into the Griffin plant, he oversees route assignments and troubleshoots any delivery challenges. His 10 drivers will make drops at 1,325 locations across the Inland Northwest, refilling racks in grocery stores, bars, hospital waiting rooms and coffee shops from Sandpoint to Pullman. "I still don't know how it gets done every week," he says. "It's awesome." 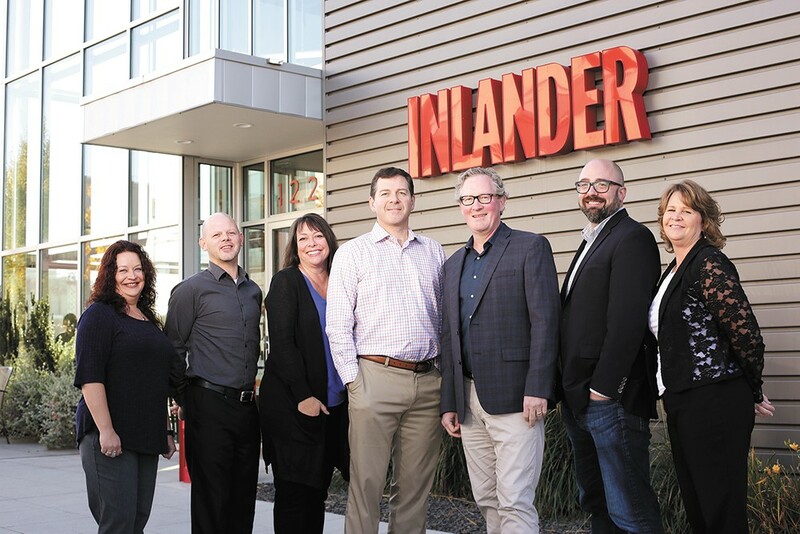 The Inlander's management team (from left): Marketing Director Kristina Smith, Production Mananger Wayne Hunt, Advertising Director Kristi Gotzian, General Manager Jer McGregor, Publisher Ted S. McGregor Jr., Editor Jacob H. Fries and Business Manager Dee Ann Cook. From his third floor office at the Inlander headquarters in Kendall Yards, Publisher Ted McGregor has watched downtown Spokane grow and evolve at a historic rate. When the paper moved to the north bank of the Spokane River five years ago, this development was little but a gravel lot. Now, the paper packs in beside coffee shops, galleries, restaurants and condos. Across the Monroe Street Bridge, five construction cranes can be seen spiking the skyline. McGregor knows the local political and cultural scene has transformed just as quickly. News radio chatters lightly as he settles into a sofa between proofreading pages of the next paper. "A great paper really is part of the texture of a community," he says. "The Missoula Independent closing, that's probably the saddest part for me. ... That was a huge part of what made Missoula a cool, hip city. Hopefully something will come along and replace that vibe." McGregor, 53, first conceived of the Pacific Northwest Inlander as a class project in graduate school. He had worked at the Seattle Weekly and saw how weeklies could share new voices and ideas. McGregor, together with his brother Jer, launched the paper on Oct. 20, 1993. "At the time, I felt like the biggest crime that dailies were committing was they were kind of boring," Ted McGregor says. "I wanted to tell stories. I wanted to do different kinds of stuff. ... We do try to surprise people." The fourth generation Spokanites spent the early years juggling duties. They wrote stories. They manually pasted copy onto pages. They delivered papers out of their cars. They recruited their mom to sell ads. "The first 10 years was just running as fast as you can trying to figure it out," says Jer, 48, who still serves as general manager over business operations. The company has since grown to about 35 people and continues to turn a profit. Ted McGregor says the Inlander has always tried to champion the people and things that make the Lilac City special. Even through years with little to celebrate, the paper has told the stories of the everyday heroes, weirdos and risk takers. "I wouldn't say that we're a crusading newspaper," he explains. "But if we did have a crusade, it would be more of a subtle message that Spokane's got a lot going for it and we should protect it and we should nurture it to be better." 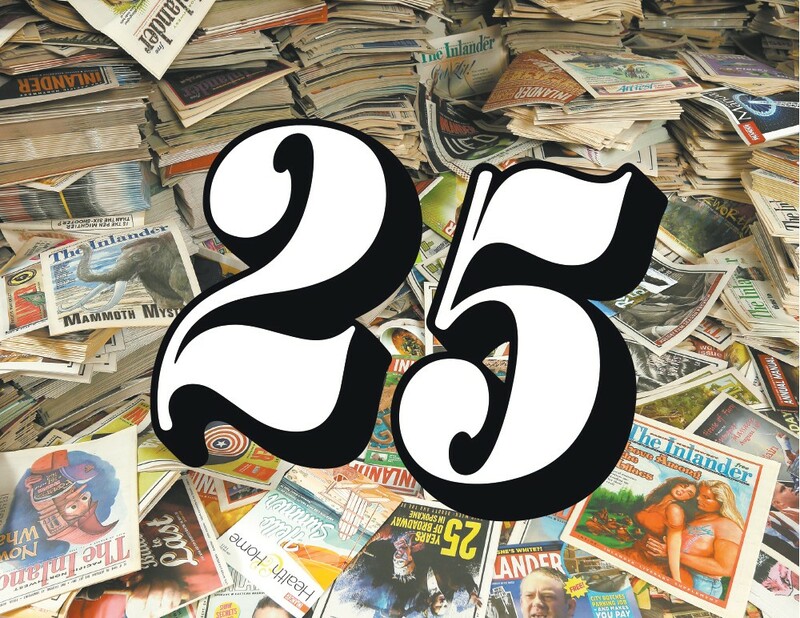 As they mark 25 years, McGregor asks me to tell a part of the paper's story. Who is the Inlander? How does it all get done every week? What are the little moments that make it special? Try not to be boring. An editor walks into McGregor's office and tosses a pile of new draft pages on his desk for proofing. McGregor looks at the desk and back at me. "I do have to read those pages," he says. Upon finishing the week's paper, the Inlander editorial staff resets each Wednesday morning. News and culture writers huddle over their coffee mugs in the conference room to critique the previous paper while looking ahead to the next week's projects. Writers ask each other about how articles came together or suggest follow-up stories. Editor Jacob Fries lays out a copy of the latest edition, featuring a cover package on Amazon. Staffers say the package provided fairly comprehensive coverage, breaking down the complex ramifications of Amazon's expanded local influence. It brought together different perspectives. It made abstract concerns feel real. "The stories were very digestible," Food and Listings Editor Chey Scott says. "We need to get new art of Al French," Culture Editor Dan Nailen chimes in. "I feel like I've seen that picture a lot. Maybe he just always looks like that." Fries explains later that he wants the newsroom taking on the issues actively redefining the Inland Northwest — urban development, the arts community, criminal justice reform, education spending. He challenges writers to find the human stories that reflect local impact. Aside from the paper, the Inlander organizes several community events, including Inlander Restaurant Week, Winter Party and Volume Music Festival. "My mission ... is to be essential to readers," he says. "The big themes to me are what direction are we heading in as a community." After reporting stints in New York and Florida, Fries returned to his hometown to helm the Inlander newsroom 10 years ago. He says he's grateful to have the support of owners who provide the resources to tackle ambitious stories. "They've invested in staffing levels that are greater than our peer papers," he says, listing off Seattle, Portland and Los Angeles weeklies. "The McGregors could run a much leaner, cheaper, shittier paper if they wanted to — and they don't." While most alt-weeklies focus on arts and entertainment, the Inlander's four-person news team prioritizes in-depth coverage and narrative-style storytelling. Fries prides himself on the paper's accountability and social justice reporting, noting people have been released from prison or mental hospitals due in part to their work. Much of that work has won national awards. "If we did have a crusade, it would be more of a subtle message that Spokane's got a lot going for it..."
But he also enjoys helping Spokane discover its hidden talents. From the live music scene to the local literary movement to the emerging restaurant culture, the Inlander amplifies those conversations. It showcases the successes and seeks lessons from the failures. Back in the staff meeting, someone asks about the new Lime scooters. Discussion breaks down as everybody jumps in at once. One writer spotted a scooter in Spokane Valley. Another says the GPS app shows at least one is probably already lost in the Spokane River. "Ted bought helmets for the office," Scott notes, quickly adding, "I just hope Spokane doesn't screw it up for everybody." When sales reps go out to pitch clients on advertisements, they talk about a lot more than just print ads. Advertising Director Kristi Gotzian says they talk about community. As the Inlander has grown, it has increasingly served as a catalyst for cultural engagement. Staffers now help organize the Volume Music Fest, Inlander Restaurant Week, Snowlander's Winter Party, the Best of the Inland Northwest and sponsors many other local events. "We're supporting those businesses and we're supporting that culture," she says. "It feels like we're on the inside of all the good things that are happening in Spokane and Coeur d'Alene." Gotzian says her team tries to convince businesses to buy into that positive momentum — the idea that a vibrant culture builds community, keeps young people in Spokane and introduces them to new customers. "They're looking for ways to break through all the clutter," she says of the Inlander's clients. "What's real is standing in front of people and making an impression." Carolyn Padgham-Walker, an Inlander sales rep for the past 13 years, agrees. "Our backbone is local community businesses. We've invested in them, and they've invested in us." Jer McGregor ducks into his office between planning meetings. Winter Party is coming up quickly, he says, and they have already started working on next February's Restaurant Week. A lot of that event planning and execution will ultimately fall to Marketing Director Kristina Smith, who's been with the paper for 17 years, having worked her way up after starting out as an advertising assistant. Part of what's kept her at the Inlander, she says, is the feeling she's a part of something bigger. "We've always had a mission of doing well by doing good," Smith says. Looking back, Jer says it took years before the Inlander had the "bandwidth" to start launching new publications and hosting annual events. They had to recruit a strong leadership team. They had to establish a brand. They had to build local relationships. And they had to learn to ask for money. He raps his knuckles on the glass table in front of him. "You want to create an environment where people feel connected," he says, "and they feel like they're a big part of what goes on here and that what we're doing matters." As the Inlander's role in the community has expanded, Jer says he has seen how the company can help local businesses, nonprofits and artists thrive. He says he enjoys that sense of collective success — floating all boats. But he also stresses the importance of protecting the paper's journalistic integrity from its increasingly entangled revenue interests. The business side needs to stay out of the newsroom. "The Inlander has to mean something to people when they see it," he says. "It needs to mean trusted journalism, quality design [and] quality content." Amy Thomas needs to share her story — the lousy shifts, the dangerous driving, the alleged denial of any overtime pay despite working upwards of 90 hours a week. Inlander writer Wilson Criscione finds her waiting out front of her North Spokane home when he arrives. She motions through a side gate. "I'll take you around back," she says. As they settle into deck chairs, Criscione asks about her time with a regional trucking company now facing a class-action lawsuit over wage theft. Thomas explains drivers got flat fees for a day's deliveries, even if it took many extra hours to make their stops. She says they sometimes drove 16 hours a day. "Is it safe to be operating heavy machinery or driving that much?" Criscione asks. "It's not," she says. "We all took turns buying energy drinks, buying coffee, but I mean at some point you're a human and you can't run that much." When he returns to the newsroom, Criscione will have to pull her story together with everything else he can find about the company. He will have to make sense of the scattered fragments of perspective, the legal records and key context. He will have to try to answer readers' questions before they ever see it. The Inlander is printed by Wenatchee World-owned presses and is trucked to Spokane on Wednesday mornings. Nearby, other editorial staffers pull together their own fragments. News writer Samantha Wohlfeil researches pollution in the Spokane River. 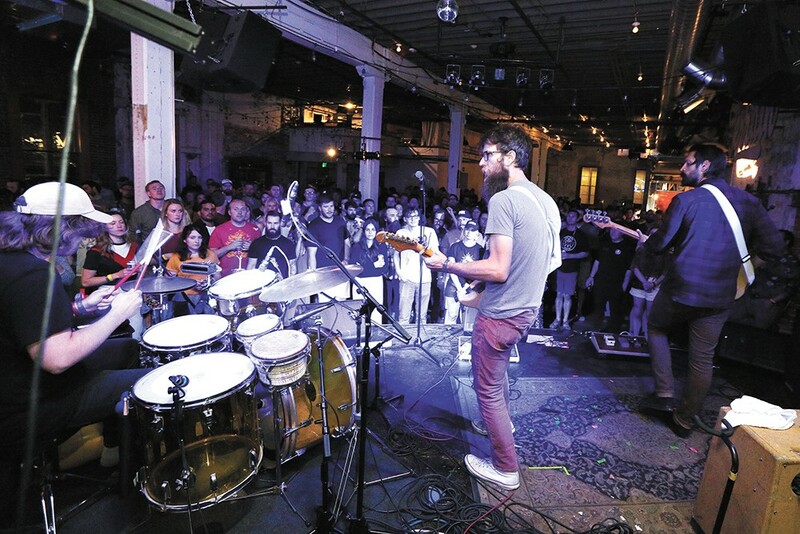 Film and Music editor Nathan Weinbender works on a piece about a new music venue. Art Director Derek Harrison reviews drafts of the upcoming Fall Arts special edition cover. Stationed at her cat-poster-covered cubicle, Food and Listings Editor Chey Scott compiles the week's event calendar in between managing her freelancers and writing a feature on a local dance troupe. "I've been doing some fun profiles," she says of the Food section. "Finding these really kind of niche, weird stories ... is what the Inlander has always excelled at." Sorting through calendar events can be tedious and time consuming, but Scott knows it's why a lot of people pick up the paper. They want to know what's going on and where to go this weekend. She also appreciates being the first to hear about exciting new events or businesses. Scott notes several staffers, herself included, grew up in Spokane. They bring that investment and institutional knowledge to their work. When weeklies close in towns like Missoula, she says, readers lose that local insight and dialogue. "I think that is a huge asset for us," Scott says. "We know Spokane and have that unique perspective to share how it's changed and why it's a great place." Despite the modern design throughout the Inlander building — the sliding glass office doors, exposed ductwork and accent lighting — business manager DeeAnn Cook still files payroll from behind an edge-worn wooden desk. Ink has leached into the grain as the veneer has come off. Cook says she can't wear white clothing anymore without picking up streaks of past editions. "This is Ted's [old] desk," she explains. "We tried to get it away from him years ago to get it refinished and he bought another one. But I can't let go of it. ... I'm a little sentimental I suppose." Cook joined the Inlander 20 years ago to handle accounting. She remembers typing individual salaries and ad sales into QuickBooks while the McGregors hovered over their light table, pasting up the latest issue. As the company has grown, she has taken on everything from HR complaints to bathroom repairs. "I wouldn't have been here for 20 years if I didn't feel strongly about who I was working for." "Every business has its quirks, but there's a lot of longevity here," she says. "I wouldn't have been here for 20 years if I didn't feel strongly about who I was working for. ... We've got a fantastic team." Cook shares the first floor with the small production team, which serves as the creative force behind the paper's layout, ad design and much of the Inlander's overall look across its other publications like Health & Home (edited by Ted's wife, Anne) and Annual Manual (edited by Jer's wife, Tamara). The designers also sometimes doodle cartoon characters for Cook on their timecards. She hung them on her filing cabinet like a proud mom. Production manager Wayne Hunt, who joined the paper 12 years ago, acts as the link between editorial, advertising and distribution. He oversees designers. He handles IT and in-house logistics. A little of everything. "I like to consider myself the stage manager for a play," he says. "I put out a lot of fires. ... I look for ways to create efficiencies." More than anything, Hunt likes fixing problems before they happen. He likes empowering the Inlander's staff to do things better. And once all the final pieces of the paper come together, he gets it sent off to the press. "I"m not in charge of people creating their awesomeness," he says, "but other than that — I make sure it gets done." Back at the Griffin plant, driver Len Wavra backs his PT Cruiser up to the loading doors. Each week's paper gets printed at the Wenatchee World press before getting dropped in Spokane Valley for final assembly and delivery. Wavra tosses bundles into the back of his car, watching the bumper sag under the weight of his two routes' worth of papers. "I delivered newspapers even when I was a kid," the 70-year-old says between bundles. "It's just something that I've always done. ... Newspapers are in my blood, I guess." Wavra makes drops all across the South Hill from Wednesday morning into the evening. Many stops know him by name. He delivers to the hospitals, hauling bundles into waiting rooms and lounges. He packs a thermos of coffee and picks up cinnamon bread at a bakery on his route. He uses disposable gloves to keep the ink off his hands, but says he still comes home covered. As Wavra makes his rounds, the weekly miracle has already started into its next cycle — stories remain untold, pages sit empty. That's the magic, Ted McGregor says. It's a blank canvas. Jacob Jones is a freelance writer and the founder of a new initiative, Whitman County Watch, a reporting project on public engagement in local government. He previously worked as a staff writer for the Inlander and the Daily World in Aberdeen. The original print version of this article was headlined "The Weekly Miracle"